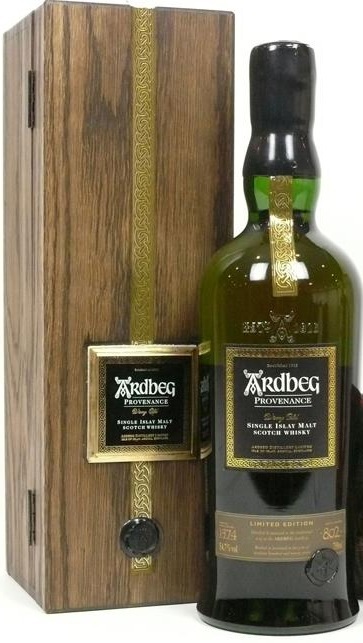 2 of 4 of the monumental Provenance series for Ardbeg. These are landmark whiskies. This is Ardbeg buried in deep compost-y loam, oily and tarry, and immensely peaty but in the sense of phenolics and not brute smoke and fire. Absolutely fumigated with black exhaust smoke and chunks of sooty charred ends. Hot engine oil, bitumen paste, muddy silty brine and the sting of salt just at the tip of your tongue. Unquestionably sublime. Can you make silk of seawater and render earth divine? In the cathedral of Ardbeg’s stills you can. Though absolutely not the whisky to end the night with, for a whisky whose joy is its subtlety is ill treated thus. The same architecture (I have tried one other Provenance they all stand in line) but this one heeds the call of the sea: Salt air, silty brine, dried lemon zest, drying seaweed on dirty nets, white sand flinty hot in the sun, and a hundred inky-oily-coastal notes not spoken for. Finds also a camphor and rooty must aspect to its phenols. Yet it remains equally exceptional, with a salty flourish engendered by perfect poise. Yet the cost for this seems to be a loss of the deeper earthier aspects, which is no loss at all if one were to consider them two sides of the same coin. No, its no loss at all, on the tongue it reveals itself to be a raging beast. Razor sharp and singular in its zesty salty intensity. A ringing clarity reverberates as a pick axe against the mountain. Peaty and phenolic in ways that belies description. A masterstroke that beggars belief. This entry was posted on January 18, 2019 by Whiskyrific in Ardbeg and tagged Ardbeg, Provenance.